"Oh!" said Jen again, when they had entered by big iron gates, and the great house at the end of the drive came into sight. She looked at Joy. "What a lot of things you've got!" she said, without a twinge of envy, but in frank admiration. Joy laughed. "Have I? Such as -?" "It's all yours, isn't it? All the miles of gardens, and this gorgeous house? And then being Queen - and the girls say you're a musical genius - and you're pretty." My parents provided a classic example of British class mobility in the twentieth century, combining upwardly mobile working-class Londoner with downwardly mobile upper-class countrysider in a family which nonetheless failed to adopt middle-class norms and values successfully. My father was born in 1928, the son of a "gentleman farmer". He grew up on the family farm in Suffolk, and, like his elder brother attended Ipswich School, a minor public school. But whereas my uncle went on to Queen's College, Cambridge and into the RAF before qualifying as a surgeon at a famous teaching hospital in London, my father left school in 1942 at the age of 14 to spend the rest of the war working on the farm, with little regard for formal education and in the belief that farming would be his career. However, their father developed a brain tumour in the mid-1950s, as a result of which he lost most of the family assets on the stock market before deciding to sell the farm and to move to a town house in nearby Ipswich. 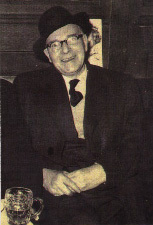 My uncle, having married a Scottish nurse, emigrated with his family to Canada, while my father accompanied his parents to Ipswich and looked after them, taking out his frustrations in a social life which continued to revolve around the Young Farmers' Club (whatever the impression given by the name, by all accounts they were a wild set). Meanwhile my maternal grandfather was born the youngest of seven children in 1900, his father having died before his birth. He grew up in a tenement in Lambeth, South London, sharing an outside tap with dozens of other families. His mother worked as a seamstress, leaving my grandfather to the care of the other children, and at the age of two he narrowly escaped death when he fell into the fire and was seriously burned. Later his two eldest brothers were "rescued" from the family home by the Dr Barnado's charity and sent to work in Canada, plunging the family deeper into poverty, but my grandfather eventually became an apprentice printworker in his early teens, a much sought-after position. To his lifelong regret, however, my grandfather was removed and put into a candle factory by his mother when the First World War began; with his remaining brother away fighting, the family was unable to manage on an apprentice's wages. 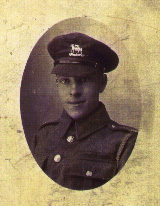 Later my grandfather joined the army, missing the action only because he went on to take further training; he was one of the first soldiers to be sent to France following the Armistice. He then served in Germany and India, where the height of his career was arranging the entertainments, including performing himself on the banjo. My grandfather returned to London in the late 1920s, where, after his mother remarried, he married a woman he had known in his teenage years, who was also a seamstress. Despite the Depression, his army background was enough to gain him, first, a position as a London bus conductor, and then a rented house of his own in a local authority owned "garden estate" in south London which was completed in the early 1930s. His family were the first to live in a house which included a sitting room, dining room, three bedrooms and, wonder of wonders, an inside bathroom. My mother was born in 1934, the middle child, sandwiched between a brother who was bright enough to win a free place at a grammar school and a sister who was good at sport. The family survived the war together - as did the house, despite some near-misses - but shortly afterwards my grandmother developed breast cancer and died. As my mother points out, there was no state and little charitable help available then for widowed fathers, despite there being many schemes for widowed mothers, and my grandfather found it difficult to manage. Despite having at least one opportunity to do so, he never remarried, but later found an outlet by becoming active in the local Labour Party and Transport and General Workers' Union - which meant that he spent even less time at home. The remainder of my mother's childhood was deprived both emotionally and financially, with her main sources of comfort being the local mission hall and the Girl Guide company. 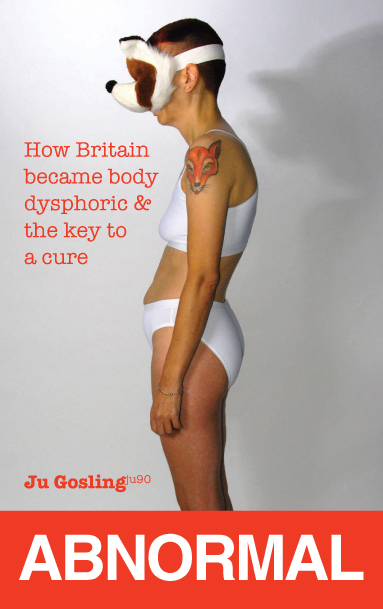 Despite being ambitious, she was unable to afford to stay at school beyond the age of sixteen, so worked for two years in Foyle's Bookshop, Charing Cross Road before being accepted for nurse training at St Helier Hospital in South London. By the time that my parents met at a dance in the late 1950s, she had qualified as a State Registered Nurse and a State Registered Midwife and had left London behind her, working as a midwife in Ipswich. My parents' relationship quickly progressed, but my father was in no position financially to marry. His father had died, and the will required both him and his mother to leave their Ipswich home. There was little capital left, and without qualifications my father found it hard to get work, with brief spells as a draughtsman and a van driver breaking up longer periods of unemployment. My paternal grandmother came from a middle-class East Anglian family, and her unmarried sister (pictured), had moved soon after the Second World War to a small seaside town in Essex on the East coast of England. 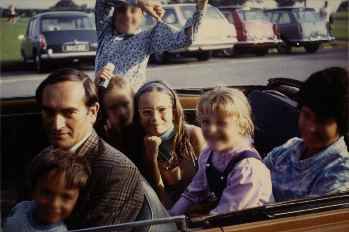 "Auntie" had adopted a daughter, who was a teenager by the early 1960s, and made a living by providing lodgings for girls attending a nearby private school (this was defunct by the end of the 1960s); and in the holidays for small children taking a seaside holiday accompanied by their nannies and for actors appearing at the local summer repertory theatre, based in the Women's Institute hall. My grandmother used the last of the family money to buy a detached house in the same "upper" avenue as her sister, and at the end of the 1950s she moved there, accompanied by my father. My grandmother must have had mixed feelings about my mother, but eventually realised that offering them both a home so that my parents could afford to marry was the surest way to keep my father, on whom she had relied since he was a teenager. The marriage duly took place at the local Registry Office - there was no money for a church ceremony, although my mother at least would have preferred one - and my father later found work selling insurance door-to-door for the Co-Operative Insurance Society . My mother easily found work at the local maternity hospital, but quickly became pregnant herself, only to lose the baby in a miscarriage before giving birth to me in May 1962. My birth came as something of a surprise to both my parents, since they had been convinced that I would be a boy. I entered a house which was dominated by old ladies: my grandmother; "Auntie"; and their friends. I was the apple of their collective eye, but my mother was not so fortunate and found the domestic arrangements very hard to live with, as well as, unsuprisingly, finding it difficult to form a bond with me in the circumstances. 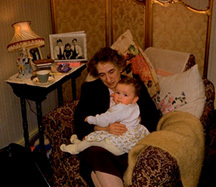 By the time that my sister arrived in March 1964, though, my grandmother was content to leave her care to my mother. Meanwhile I enjoyed sitting on "granny's" lap and waiting until she pretended to go to sleep to take a chocolate mint from her box; we both pretended, to our mutual pleasure, that a mouse had eaten it. Perhaps my grandmother's health was declining; in any case she died in her sleep the following year, shortly before I was three. Her body was discovered by my infant self; I had been used to going into her bedroom first thing in the morning, and couldn't understand why Granny wouldn't wake up. My uncle and his wife, arriving promptly from Canada, signed over their half of the house to my father in return for removing the remaining family valuables, and my family continued to live there until the early 1990s, joined by my brother in April 1967. In comparison to what is taken for granted by most children in Britain in the late 1990s, there was little domestic technology in our house - our washing machine had to be pulled out from the wall and attached to the sink by rubber hoses which frequently flooded; hot water was provided by a coal-fired boiler; and a tumble dryer was unthought-of luxury. I do remember a toaster in the 1970s - or at least setting fire to the kitchen whilst using it - but microwaves were unheard of. We had no record player, and the only radio station which we could receive without interference was the pirate Radio Caroline, whose ship was eventually washed up on the sea wall which bordered the marshes to the south of the town. I did, however, receive a tape machine from my parents one Christmas in the early 1970s, and this I used to play music tapes which I had recorded from the radio as well as to create spoof programmes with my father. And I will always remember when my father brought home his first pocket calculator, a Sinclair. This cost what seemed to us an enormous amount of money and performed only the most basic functions, but we regarded it with amazement. My home town had been a popular Edwardian resort for the upper middle classes, partly because it was situated less than a hundred miles from London and was easily reached by rail. In the 1960s it still clung to its former reputation, resisting all attempts at modernisation. There were byelaws banning anything and everything thought to be "common", from public houses to fish and chip shops, from cycling on the promenades to eating on the greensward, from selling icecream or gifts on the beach to playing a radio in public. Holiday visitors were necessarily of a staid disposition, and many were Londoners with second homes in the town. Citizens were divided into two groups: those who lived within the old town "inside the gates"; and the less fortunate who lived "outside the gates" in more modern homes. The boundary was created by the railway line which ran about half a mile parallel to the coast, the rickety wooden "gates" closing off the level crossing when trains ran through. In retrospect the attitude of the townspeople seems almost defiant given the egalitarianism of the 1960s and the new glamour of the working classes; it certainly fuelled my cousins' beliefs that my family were "snobs". The origins of the town lay in Saxon times, but in the past millennium the coastline had been heavily eroded, and, like much of the East Anglian coast, the town was now surrounded by flat, marshy countryside which frequently flooded. A tiny church which had been listed in the Domesday Book now stood close to the beach, and the low clay cliffs continued to crumble during my childhood, resulting in at least one fatal accident before they were shored up at the end of the 1960s. The beach itself consisted of the stereotypical miles of golden sands divided by wooden breakwaters, although the picture was often somewhat spoilt by the sewage pollution from a local outfall pipe. The past erosion of the cliffs also meant that at low tide the unwary risked slipping on patches of clay when they ventured beyond the breakwaters which prevented the sandy beach from being washed away by the tide. A concrete promenade divided the beach from the cliffs, and this was lined with wooden beach huts. Many of them dated back to the 1920s, until a storm swept hundreds away in the mid-1970s and they were replaced by modern constructions. (Unfortunately a second storm later the same winter destroyed many of the replacements, although there have been no similar occurrences since.) These huts could be bought or hired, with land rent paid to the local council. They provided popular bases for days on the beach, but inevitably a byelaw prevented anyone from staying in them at night. At the top of the cliffs, a greensward divided the beach from the old town. This part of the town consisted largely of one "avenue" of shops, with five "avenues" of houses running at right angles from the cliffs to the railway line. These avenues were bisected by a road running parallel to the coast, with the "upper" avenues containing smaller and less desirable houses. To the north, a jumble of smaller roads and lanes led to the next town, an overgrown fishing village. Despite the town's upper-class pretensions, most of its citizens were solidly non-intellectual middle class, including many with working-class origins. 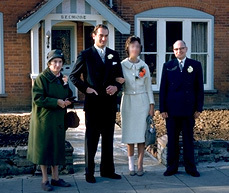 At the beginning of the 1960s there were still many elderly residents with upper-middle-class origins - the town was often laughed at in the surrounding area as "the last bastion of the British Empire" - but by the end of the decade most of these residents had died, to be replaced by other retired people. Meanwhile the majority of men of working age originated from London and commuted back to jobs in the City. There were few local jobs apart from in the shops, and these were mostly staffed by women. For most of the week, then, the town was occupied only by women, children and the elderly. Later, a road sign outside Colchester was to become famous when it was graffitied to read "Harwich for the Continent; [my home town] for the incontinent" (a sign of which I was uncomfortably aware, since I had poor bladder control during my childhood). With public houses banned, the only places to socialise and drink were the bars of the decaying hotels, although men could also join the "Memorial Club", which was I think dedicated to those locals who had been killed in the two World Wars. My father never became a member - he rarely drank alcohol, mostly due to lack of money - but later my grandfather was to enjoy a drink there when he came to stay with us. The town did have a golf club, tennis club and cricket club which provided sports and social facilities and activities, but the membership of these was almost entirely composed of commuters and their families, together with the people who owned summer homes in the town. Probably deliberately, the membership fees were set too high to allow families like mine to belong, although - perhaps as a result of a "pools" win - we spent one blissful summer with swimming membership of the tennis club (swimming in the sea was considered to be very infra dig in the first age of the swimming pool). Unsurprisingly, the townspeople were heavily conventional and solidly Conservative (with both a large and a small "c"). Almost all were white, although there was one mixed-race boy at my primary school and an Afro-Caribbean girl at a neighbouring school. In my last year at primary school, in 1972, a Ugandan Asian family moved in temporarily, but later left for a permanent home elsewhere. Racism was generally covert, but a half-German girl suffered considerable abuse as a "Nazi". My mother, who had dark hair and eyes and deeply tanned olive skin (probably inherited from my maternal grandmother, of whom we know little), and my brother, who had inherited the least English side of both my parents' looks, were viewed with suspicion, and my brother was often called "meat face" at primary school. (With paler skin and green eyes, it was only many years later, when a girlfriend referred to my "exotic" looks, that I realised my parents' mixed blood had always affected both my appearance and attitudes to me too.) I certainly felt that many of my parents' friends in the town looked down on my mother, partly because of her working-class London background - even if theirs was similar, they now enjoyed a far higher standard of living than my own family - and partly because of her complexion. The social upheavals of the 1960s largely passed us by, although there were once exciting rumours about a "pop festival" held in the neighbouring countryside. Instead, the town was heavily religious, with the Church of England, Catholic Church, Methodist Church, Free Church, Gospel Hall and Christian Science all represented. (In addition to these, pentacles often appeared on the beach.) My sister, brother and myself attended the Church of England's Sunday School, although my family's attendance at the actual church services was sporadic (it was only in retrospect that I realised why my parents liked an hour to themselves on Sundays). Later, in the mid-1970s, my mother and sister attended the Free Church, which was similar to the better-known Baptist Church (although I have more recently seen it described in a national newspaper as a "cult"). My mother found that these services reminded her of the London mission hall where she had attended services as a child, while my sister was tempted by the fact that the Free Church operated the town's only youth club. Unlike my sister, I decided that the benefits of belonging to a youth club were not worth the price of attending church every Sunday. However, in the summer holidays the churches were further augmented by the Children's Special Service Mission (CSSM), who conducted services and social activities on the beach. The mission workers were students and I joined in their events happily, becoming freshly converted to Christianity every August and lapsing every September. In the early 1990s, when I watched the repeated BBC adaptation of Jeanette Winterson's Oranges are not the only fruit (Pandora, London, 1985), I realised that I knew the words and tunes to every religious song portrayed in it as a result of the heavily evangelical atmosphere of my childhood. Like Winterson, I left as soon as I could, taking an au pair's job in Paris a few days after leaving school and a few weeks after my eighteenth birthday. My mother remained in the town, my sister returned to it and my brother now lives close by, but I continue to find it too oppressive to remain there longer than overnight.